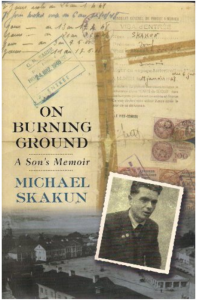 Michael Skakun is a writer, journalist, translator and memoirist, as well as a public affairs consultant. Born in Jaffa, the oldest port in the world, he has lived nearly his entire life in the United States and studied with Alfred Kazin, the late literary critic and author of the acclaimed “A Walker in the City.” He served as editor and columnist for various metropolitan weeklies. As a special consultant to the United States Holocaust Memorial Council, he prepared literary and educational materials for National Remembrance Week, observed in all fifty states. Active as an events coordinator in New York, he has helped organize a commemoration in honor of Sir Isaiah Berlin, the Oxford philosopher, Octavio Paz, the Mexican poet and Nobel laureate, as well as a celebration of the Marshall Plan and a host of lectures by noted civil and cultural figures. Michael has written for a number of publications and entities including the Jewish Press and the Center for Jewish History. Articles especially of note include a review of the highly acclaimed work: Masquerade, Dancing Around Death in Nazi-Occupied Hungary, which chronicles entrepreneur and philanthropist George Soros’s father’s success outwitting the Nazis. Read more.